dropped or subject to a strong impact. A Guard Tour System enables verification and accountability of a guard's movement providing the location, time and date stamp. 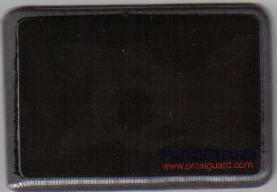 Non Contact: The significant advantage of ProxiGuard, a RFID syatem, is the non contact and the non line of sight nature. Cards can be read under water and through all the above substances. We now have a New RFID Tag for Metal Surfaces. Just Peel and Apply. Convenient: Can be installed in multiple ways. The ProxiGuard Patrol Management System works on Windows-based PCs. It is used for the processing, verification, display, and nprintout of guard tour data obtined from the Guard Tour readers. Automatically completes tasks such as communicating with the readers, timeclock adjustment, data upload, data download, intelligent data identification, patrol plan verification, data verification, exceptions handling, etc. It is very easy to setup and use. Several reports to choose from: BASIC REPORT, FREQUENCY REPORT, PATROL DETAILS, and MAP REPORT (Graphical report). All reports can be either viewed on the screen, printed, emailed to MS Excell, or Pdf. The software automatically performs data processing and verification tasks when it receives guard tour data from the readers. The software automatically performs backup and old data archiving in the background without the need of user intervention. Just Peel On Metal - 1/3/4" x 1-1/4" x 1-1/16"